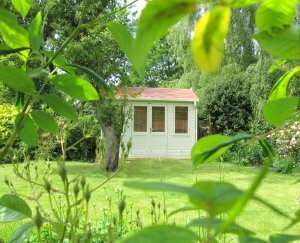 The Langham is a traditional Studio with desk height windows to make it ideal for use as an office or hobby room. 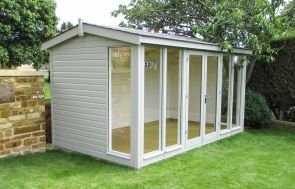 With a wide range of features to choose from, this structure will suit and add value to any garden, and as with all our Studios, it is fully lined, insulated and double glazed, allowing you to use it all through the year. 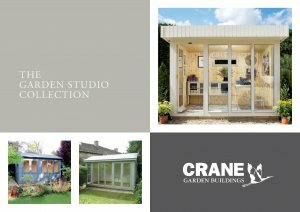 To obtain a price for your own ideal Langham, click on the Create My Studio tab below. Our Langham doors are double glazed using toughened safety glass, and finished with either polished brass or chrome fittings, a 5 lever mortice lock and draught excluders. 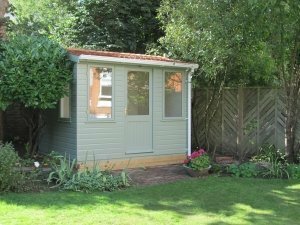 With our Langhams, you can have a single door, double doors, an extra door set, or a solid joinery door (if you have a storage partition as part of your design). You can also have an internal door to access another partition. 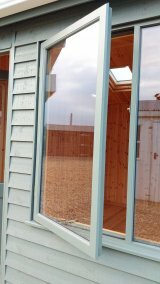 We make our own windows within our Joinery Works to ensure quality. The Langham comes with 3 desk height, double window sets. One half of each set includes an opening window with a lockable catch for controlling air flow. All windows are double glazed using toughened safety glass. They are finished with polished brass or chrome, lockable window fittings for added security and are fitted with draught excluders. These desk height windows are available in either single, double, or triple window sets, which you can choose depending on your requirements. Velux® windows can be fitted in the roof of our Langham Studios to help allow more light into your building. 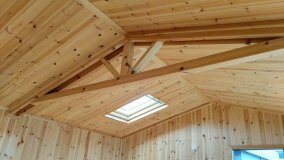 These are especially helpful if the Studio is to be installed in an enclosed area, to allow light in through the roof. 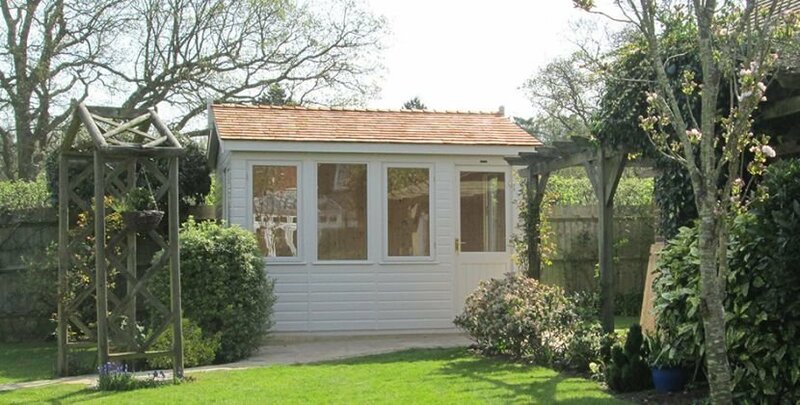 Our Langham Studio comes with your choice of roof covering: select either Cedar Shingle Tiles or Slate Effect Roofing Tiles in terracotta or grey. 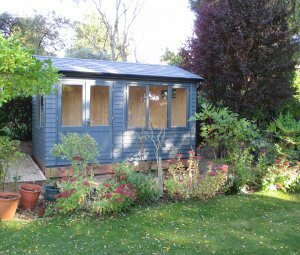 Both of these roof coverings add longevity to your Studio, they don't require much maintenance, and they are attractive and sit harmoniously in outdoor settings. 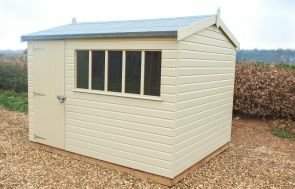 To finish off your Langham Studio, you can also opt to have guttering to help catch excess rainfall off the roof, and scalloped fascias for a more elegant style. Doors - Desk height glazed, joinery made door. 1900 x 750mm (high x wide) for a single door or 1900 x 1350mm (high x wide) for a double door. Double glazed using toughened safety glass. Fitted with a 5 lever mortise lock and solid brass fittings set on ex 75 x 75mm door frame that is fitted with draught excluders. Windows - 3 desk height, double window sets. One half of each set is a side hung opening window and the other half a fixed window. All fitted with solid, lockable brass furniture and draught excluders. They are double glazed using toughened safety glass and set in joinery made frames. Floor - ex 19 x 125mm tongue and groove floorboards on ex 38 x 75mm tanalized planed floor joists set at no more than 450mm centres. The floorboards are insulated underneath. 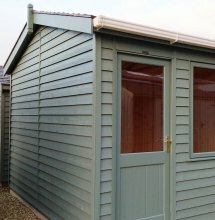 Paint - Externally, you can choose between two paint systems: Valtti or Farrow & Ball. Both paint systems offer an opaque coverage and have long re-decoration cycles with a wide range of natural colours to choose from. For more information, please see the Paint Ranges section on the Options tab.. 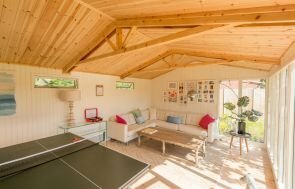 Looking for a modern studio with an apex roof?